Between the 10th and the 14th of August 2011 Santa Clara Golf Marbella have organised the summer open tournaments, with a great number of players. Marbella 29th August 2011. The Club big week started last August 10th with the X Anniversary Cup – single stableford handicap – with 80 players divided into three categories. The winners were, on first category (handicaps from 0 to10), Antonio Rodriguez Yaguez with 40 points, on second category (handicaps from 10.1 to 20), Claude Botbol with 39 points and on third category (handicaps from 20.1 to 36), Jose Luis Moreno Ronda with 42 points. On August 11th it was held the Santa Clara’s Cup – fourball medal play handicap – taking part in the competition 58 pairs, also divided into three categories. The winners were, on first category, Antonio Rodriguez Yaguez and Antonio Gomez Garcia with 59 strokes, on second category, Jose Luis Rubio Virseda and Gervasio Rubio Martinez with 61 strokes and on third category, Javier Lopez Bartolome and Jesus Herrero Gala with 65 strokes. On August 12th was held the President’s Cup – pairs scramble medal play handicap – taking part in the competition 48 pairs in three categories. The winners were, on first category, Ken Spencer and Mike Heathfield with 62 strokes, on second category, Gonzalo Montes Amayo and Jose Agustin Ferrin Gutierrez with 59 strokes and on the third category, Fernando Mena Alvarez and Jose Felix Garcia Carrasco with 56 strokes. Finally, on the 13th and 14th of August, it was held Santa Clara Golf Marbella’s Golden Cup – single scratch medal play by categories, in which the participants play without handicap, taking part 65 players in the competition. The winner of this prestigious tournament were on first category, Enrique Zapata de Pablos with 145 strokes (70 + 75), on second category, Peter Paul with 165 strokes (83 + 82) and on third category, Jesus Herrero Gala with 182 strokes (87 + 95). 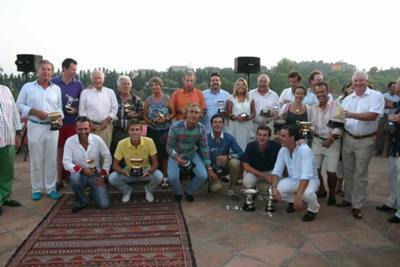 The price ceremony of the four competitions was held at Santa Clara Golf Marbella’s Clubhouse on August 14th after the Golden Cup finished, with a great cocktail party. 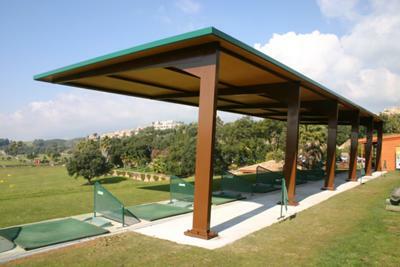 Santa Clara Marbella Golf School has just inaugurated a new metallic structure that will allow a smooth running of the School on rainy or warm days, giving protection to the players. The Santa Clara Golf School in Marbella has always been one of the best in the Costa del Sol, highlighted by its quality, beauty and spacious facilities, as it has a privileged orientation and more than 20 stations from which it is possible to use every club in the golf bag to practice any shot. In his eagerness to be always at the forefront of the new golfers’ formation, the golf club in Marbella now goes a step further in the modernization of its facilities, incorporating a new metallic structure that will protect golfers against any unforeseen weather. This new structure which now covers 8 places that will be available for both students of the School of Golf and visitors who decide to come to Santa Clara Golf Marbella to practice their golf swing. Besides Santa Clara Marbella continues to maintain their traditional practice positions including natural grass ones, which will allow the School of Golf to be opened and running all year round now that you can protect yourself in the days of heavy rain and when the sun tighten significantly. The Golf School, led by Ángel Jiménez, a professional with extensive experience and prestige in the teaching of golf, it also has two putting greens, one approach shot area, one bunker practice area and a pitching green. Just a few golf clubs in Marbella have a practice area as well situated as the Santa Clara Golf Marbella, as it is a few yards from the tees of holes 1 and 10.